A Woodgate resident has expressed his shock after an A29 realignment map appeared to show plans for a pathway to be built through his house. West Sussex County Council is looking to build a new 4.3km stretch of road to the east of Eastergate, Westergate and Woodgate. The new road is budgeted to cost £55.5m and would start near the Lidsey Caravan Park, cross the railway line, intersect the B2233 Barnham Road, before joining the A29 south of Fontwell. Read more here. After attending a consultation meeting on February 26 at Barnham Village Hall, Mick Steer, from Lidsey Road, was told the path going south from the new roundabout 'passes through' his property in the preliminary designs (pictured). This shocked Mick as he was not informed, prior to the consultation, that his property would be impacted by the plans. He said: "As a result of this realignment, the path/verge/road goes through my property Pond Cottage [and neighbouring properties]. "I have had no correspondence or notice of this from any authority. I have not been contacted at any stage as to whether there will be an impact on my property. "I can't understand how they can issue such plans at a public consultation without consulting with property owners." After raising the issue with the county council directly, Mick was sent more details designs which showed that the path actually stopped before his house. However, that has not eased all of his concerns. Mick added: "The new map showed a different detailed layout of the roundabout, path and cycle lane, which now does not go through the properties. It was not the one displayed at the consultation. "This was devastating for us, seeing our property under the cycle path, when in fact it was just incorrect maps at the consultation. It's not right to put out misinformation for the public to comment on. How many other errors or misleading facts were on view? "This was a very rushed and poor consultation. It was only offered to local residents and should have been held in Bognor so the whole town could have commented. Most of the people of Bognor and surrounding area will all be affected by this short sighted and dangerous proposal. We have a cycle lane/path that finishes at a busy, dangerous road." In light of these concerns, a West Sussex County Council spokesperson told the Observer that indicative alignment illustrations 'do not show detail' and it is 'always happy to provide detailed maps to allay any concerns'. The current timescales would see work on the northern section start in winter 2020 and be completed by winter 2021, while the southern half would start in spring 2023 and finish in autumn 2025. The consultation runs until Friday, April 26. 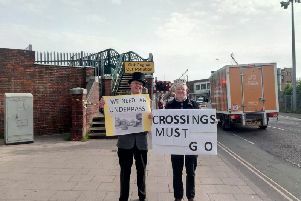 To view the proposals or to comment visit https://haveyoursay.westsussex.gov.uk/highways-and-transport/a29realignment.